Remember the soda Bubble Up? Kind of a Sprite, 7Up, lemon-lime flavor. This was one of my favorites when I was growing up. I love the new Bubble Over set and the Bottles and Bubbles Framelits in the 2018 Occasions Catalog. They pair great with the Bubbles and Fizz designer series paper that is one of the exclusive Sale-A-Bration items. Bright, fun colors and patterns make for a fun project. A fun detail is the Glitter and Clear Epoxy Shapes – Tiny little dots or tear drops. Sparkly little bubbles rising from the bottle – how fun is that? I love surprising little details like that. Posted in Create, Occasions Catalog, Sale-A-Bration, Stampin' Up! | Comments Off on Bubble Up! We are briefly crawling out of the deep freeze. A short respite before we crawl back in. It has been ridiculously cold the past few weeks. I know, I know – what do you expect living in Minne’snow’ta? Even though I have lived here all my life, I still don’t like winter. Oh how I long to be warm! Today’s card has me looking forward to summer, when the sun is high and warm and the strawberries are fresh. (sigh) Strawberries also make me think of my daughter, Jess. She LOVES strawberries. In fact, once when she was little (maybe 5 or 6) she said to me “Mom, I love strawberries sooooo much. You should have named me Strawberry Rae Haugen!” LOL . I still have to fight her for this fruit. Anyway, let’s check out my project. Aren’t those tiny little strawberries cute? The Fruit Basket set has the cutest little fruit images. Best thing – there is a coordinating punch to punch them out! The strips of designer series paper are from the Tutti Frutti pack. This whole pack screams summertime. I love it! The little banners on this card are a great way to use up some of those scraps laying around. I can’t help but think of Parks and Recreation when I hear the phrase “Treat Yourself”. I have to thank my oldest daughter for introducing me to it a few years ago. Since then, we have had our own “Treat Yourself” days. I was happy to see this phrase included in the new Picture Perfect Birthday set! Pair it with the new Picture Perfect Party Designer Series Paper Stack and you have a quick eye catching card. This DSP is a real WOW! I wanted to let it take center stage on this card, so I kept the card fairly simple. The Stitched Shapes Framelits are a great way to add a little detail to the greeting. Go treat yourself to a look at the new Occasions mini catalog! And don’t forget it’s Sale-a-Bration time – FREE stamps with a qualifying purchase!! Here is the first layout challenge, inspired by the card on page 61. I used the Lots of Lavender set. This set is a Sale-A-Bration exclusive. It is a fun and versatile set. The little pop of DSP behind the main image is from the Sweet Soirée DSP. I used the Burlap Background stamp to ground the panels. 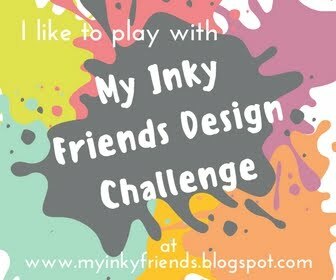 We’d love to have you play along with the Inky Friends Challenge. Go get creative!